Ionia County is a county located in the U.S. state of Michigan. As of the 2010 United States Census, the population was 63,905. The county seat is Ionia. The Ionia County Courthouse was designed by Claire Allen, a prominent southern Michigan architect. 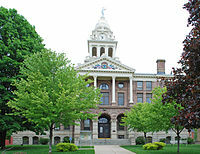 Ionia County comprises the Ionia, MI Micropolitan Statistical Area, which is also included in the Grand Rapids-Wyoming-Muskegon, MI Combined Statistical Area. The county is named for Ionia, a historic area of Greece. It was defined by act of the Territorial Legislature in 1831, and was organized in 1837. According to the US Census Bureau, the county has a total area of 580 square miles (1,500 km2), of which 571 square miles (1,480 km2) is land and 8.7 square miles (23 km2) (1.5%) is water. As of the 2000 United States Census, there were 61,518 people, 20,606 households, and 15,145 families residing in the county. The population density was 107 people per square mile (41/km²). There were 22,006 housing units at an average density of 38 per square mile (15/km²). The racial makeup of the county was 91.96% White, 4.56% Black or African American, 0.56% Native American, 0.32% Asian, 0.01% Pacific Islander, 1.04% from other races, and 1.55% from two or more races. 2.78% of the population were Hispanic or Latino of any race. 29.0% were of German, 14.7% American, 11.6% English, 8.9% Irish and 5.3% Dutch ancestry according to Census 2000. 96.3% spoke English and 2.6% Spanish as their first language. The county's population spread included 26.90% under the age of 18, 11.50% from 18 to 24, 31.00% from 25 to 44, 20.50% from 45 to 64, and 10.00% who were 65 years of age or older. The median age was 33 years. For every 100 females, there were 115.20 males. For every 100 females age 18 and over, there were 120.40 males. Ionia County has been reliably Republican from the beginning. Since 1884, the Republican Party nominee has carried the county vote in 82% of the elections (28 of 34 elections). ^ a b "Bibliography on Ionia County". Clarke Historical Library, Central Michigan University. Retrieved January 19, 2013. ^ The leading "other" candidate, Progressive Theodore Roosevelt, received 2,579 votes, while Socialist candidate Eugene Debs received 170 votes, Prohibition candidate Eugene Chafin received 165 votes, and Socialist Labor candidate Arthur Reimer received 12 votes. "Bibliography on Ionia County". Clarke Historical Library, Central Michigan University.